After earning accolades for his book-to-screen script of Precious, including a win at the Academy Awards, Geoffrey Fletcher could've played it safe and rode the waves of that success with yet another adaptation or similarly-themed project. Instead, he reveals some filmmaking gusto by taking up both writing and directing duties for Violet & Daisy, an adult fable of sorts with a brutal and surreal storytelling edge, which follows two young women who gleefully kill people for the money to pay for fancy dresses (and their apartment rent, of course). Down-to-earth storytelling and a grasp on reality are scarce in this peculiar brew of bullets, bubble-gum, and a combination of fantasy-violence farce and straight-face drama, drawing easy comparisons to the Tarantino-esque brand of provocatively mischievous cinema. What Fletcher lacks, despite a capable director's hand, is a clear perspective and an eye for sensibility, rendering his tale of young, bubbly assassins out of their depth into an absurd and unconvincing -- if oddly entertaining -- jumble. Once upon a time, in a land not so different from ours, there lived two girls with willing trigger fingers: Violet (Alexis Bledel, Sin City), a headstrong killer with some dark life experiences under her belt, and Daisy (Saoirse Ronan, Hanna), her younger and loopier sidekick. Together, the pair knock off individuals as ranked assassins in a guild of sorts (they're #8 and #9 in the organization), which barely covers their living expenses and their fascination with Barbie Sunday, a singer and fashion icon whose dresses the girls must have upon release. With another line of clothing on the horizon and their funds a little short, Violet and Daisy decide to cancel some downtime and take what's supposed to be an easy job from their handler. When they arrive at their location, however, they're caught in a peculiar situation with a sad, sweet older man (James Gandolfini, The Sopranos) who has resigned himself to death and essentially wants to assist the girls in killing himself -- before someone else does. To say the least, the man's willingness provokes some curiosity and confusion in the girls. 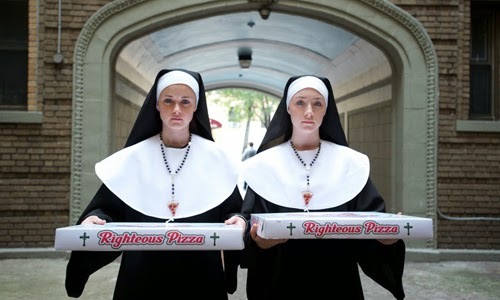 Fletcher crafts a bizarre, inflated exploitation-style tone with Violet & Daisy at the start: our first glimpse at the girls features them as pizza-delivering, gum-popping nuns with little regard for life outside their own, somewhat distressed at the cancellation of a Barbie Sunday concert as they unload bullets into goons. This sardonic tone sort of works, at first, venturing into an odd portrait of two young women with simple desires, kitschy back-and-forth conversation, and a willingness to kill others to satisfy their almost child-like needs. Eventually, however, Fletcher's blithe handling of the violence and their role as assassins clashes with the simple scenario of executing a man who lives alone in his apartment. Their lack of even base professionalism hampers everything around the hit on The Guy: after giggling and skipping away from a crime scene torn asunder by their gunfire, their "innocent" difficulties with falling asleep, running out of bullets, and blindly firing at thin air come across as irritatingly farcical instead of convincingly comical. That's part of Violet & Daisy's design, though, where it wouldn't be possible for the story's abstract seriousness to take shape without the girls' amateurish follies opening the door, as maddening as that might sound. Once they're in The Guy's apartment and considering what to do about their willing mark, the film develops a solemn angle as it ruminates on the certainty of death, secrets kept, and the mistakes of parenting, while Fletcher's absurdist angle remains at the forefront. The juxtaposition becomes fairly weird to absorb: run-ins with misogynistic gangsters, fetching bullets from a local shop, and dancing on corpses run concurrently with sensitive discussions about killing people and being truthful about one's past. It's a testament to the director's style that it even works as well as it does, where steady visual lyricism -- playful yet endearing shots of the girls in their costumes, concentrated close-ups emphasizing emotion underneath their candy-coated facades, and a few striking dream sequences -- clashes with a frustrating lack of responsiveness to reality. Ultimately, Violet & Daisy becomes something of a soul-searching journey as its second half meanders in the stillness of The Guy's apartment, concerning itself with catharsis as little details about the assassins' lives emerge while the ludicrous situation continues with their somber target. While Alexis Bledel delivers little more with Violet than how I'd imagine Rory Gilmore to act if she were over-caffeinated and homicidal (which works just fine), Saoirse Ronan takes the opportunity to branch out against type with Daisy, crafting a compellingly loopy idealist who continues with her profession for obscure reasons. Also, their mark proves to be an interesting late-career performance for James Gandolfini, where the character's musings on death couple with the actor's reliably rich screen presence for glimmers of effective introspection amid the girls' reservations. Fletcher's film makes one curious about how each of these characters will handle their demons, both as individuals and as once fathers and daughters, so it's a shame to see them squirm within the confines of such insincere circumstances.